In latest years, industrial development, intended using agricultural fertilizers and inappropriate treatment of wastewater have risen poisonous contaminants like metal ions, organic and inorganic ions such as nitrate in water and soil. The adsorption which consists of multiwall carbon nanotubes (MWCNTs) functionalized with chitosan have been synthesized in a composite to produce a magnetic adsorbent. Composites of MWCNT/nano-iron oxide were characterized by Transmission Electron Micrograph, Vibrating Sample Magnetometry, Thermogravimetric analysis and Fourier transform infrared spectroscopy. To investigate the adsorption efficiency for the adsorption of nitrate onto magnetic multiwalled carbon nanotubes functionalized with chitosan, the effect of solution conditions on each adsorption process were studied. These conditions involve the effect of contact time, pH value, temperature, adsorbent dose and the initial concentration of adsorbate. The best equilibrium isotherm model for each adsorption process was studied and the results showed the data follows Langmuir adsorption model with capacity (qm) more than 322 (mg/g). The kinetics of adsorption was also investigated, and the data were best fitted to pseudo-second order. In addition, Van’t Hoff plot was used to measure thermodynamics parameters to study the adsorption process which showed the spontaneous process. 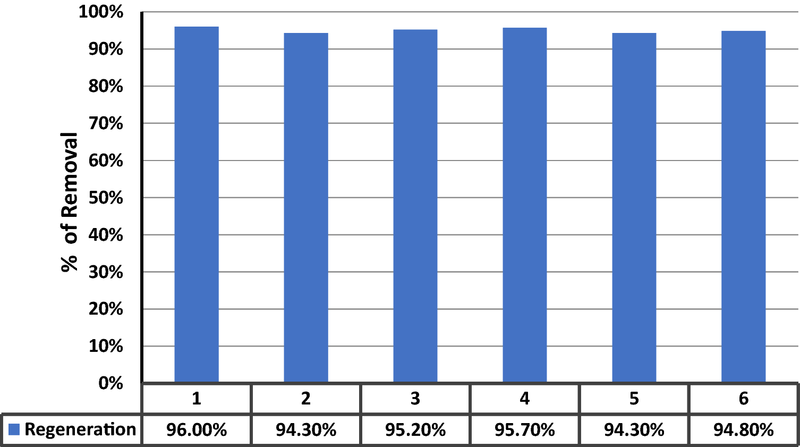 The synthesized adsorbent was also regenerated, and the percentage removal before and after adsorbent recovery was determined and showed high-efficiency removal. 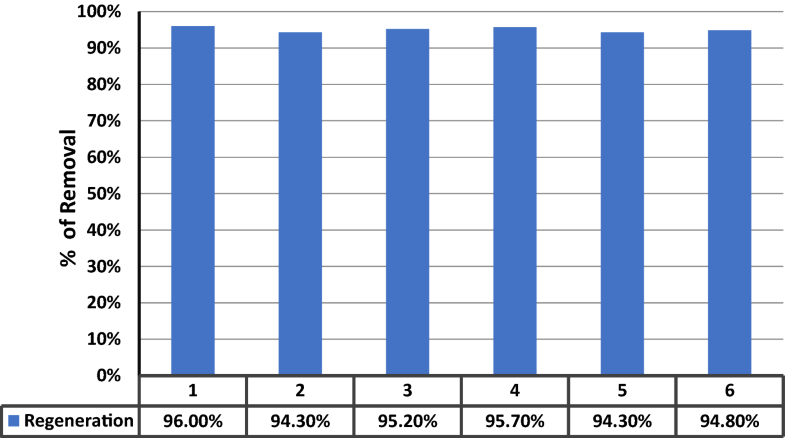 In conclusion, results showed that the resulting product has high adsorption efficiency and it showed strong complexation properties with nitrate ions. Paper presented at the Second International Symposium on Materials, Electrochemistry and Environment (CIMEE 2018), 18–20 October 2018, Tripoli, Lebanon. Rising levels of the poisonous materials in the sources of water, air and soil are a dangerous problem to human health, living sources, and environmental systems. The excessive application of fertilizers, intensive exploitation of farms and the significant contribution from industry have increased the nitrogen load discharged to receiving waterways . Nitrate contamination of water resources is becoming a serious environmental problem worldwide . Nanostructuring, activation, carbonization, and grafting are some common modification technologies of agricultural waste adsorbents. Besides, the characteristic, preparation and application of adsorbents from various industrial wastes, including natural materials and biosorbents . Organics from industries considered to be one of the most contaminants in wastewater. Some researchers utilized physical adsorption and filtration of carbon nanotubes (CNTs) and laccases to fabricate biomimetic dynamic membrane (BDM) for the advanced treatment of dye wastewater. In BDM, the adsorption, enzymatic degradation and membrane separation demonstrated a synergism effect on pollutant removal . There is a large amount of studies surrounding the usage of agro-industrial waste (AIW) for the adsorptions of organic pollutants (dyes) and inorganic pollutants (heavy metals) in water/wastewater [3, 4, 5]. Recent studies investigated new highly efficient removal of metal ion pollutants, such as toxic and nuclear waste-related metal ions . In their study, they used highly porous metal–organic frameworks (MOFs), with excellent chemical stability and hazardous metal ion pollutants. Other researchers used a well-defined core-double-shell structured magnetic polydopamine@zeolitic idazolate frameworks-8 (MP@ZIF-8) hybrid microsphere consisting of the core of magnetic Fe3O4 nanoparticles to achieve synergistic reduction and adsorptive removal of Cr(VI) abundant functional groups utilized in capturing various types of metals and other contaminants . Recently, novel-nanomaterials with excellent sorption capacities, mild stability, and environmental-friendly performance, have enabled massive developments in capturing heavy metal ions. This review firstly introduces the preparation and modification of novel-nanomaterials (e.g., MOFs, nZVI, MXenes, and g-C3N4) . Capacitive deionization is an energy-saving and environmental friendly water treatment technique with cost advantage especially for salt water with low/medium concentration. The effect and mechanism of pore structure and surface characteristics on the desalination performance of carbon electrode was studied . To decrease the level of nitrate in drinking water and make it suitable for drinking or agriculture use, some studies have been applied and reported. These encompass biological de-nitrification [1, 8, 9], chemical reduction [1, 8, 10], reverse osmosis [1, 10, 11], electrodialysis [10, 11], ion exchange [1, 10, 11, 12] and adsorption operation [1, 13]. Somehow, any of these operations has several advantages but they have some disadvantages too. Biological de-nitrification perhaps not practically applicable in groundwater manipulation, due to it is not being operant on temperatures under 7 °C. Furthermore, there could be the possibility of imperfect de-nitrification and post processing could be needed because of microorganisms [1, 14]. The hazard of nitrate constitute and eventuality of releasing poisonous composites are disadvantages of chemical operations [2, 14]. In reverse osmosis, eluting of concentration and manipulation of trashes streams are perhaps hard and membranes are canted to vitiation. Also, reverse osmosis has elevated processings costs and post manipulation is required [1, 11]. Electrodialysis operation can operate without vitiation, scaling, or chemical superinducing and has tall membrane life expectingly, but the treatment could be needed for risen levels of iron, manganese, H2S, chlorine or hardness [10, 11, 15]. In ion exchange operation, the possibility of nitrate climaxing, risen chemical employ (salt), brine tastes removal and final pH exactness are the major disadvantages. In addition to, resins are costly and retain some SO4 and hydrogen carbonate, that cause of change water content significantly. Also, it causes an augment in the chloride level in water because of substituting chloride instead of nitrate [1, 10]. Silica gels are perfect materials that can be used to purify water from nitrate because they have low cost with the high surface area, high mechanical properties and good chemical and thermal stability . 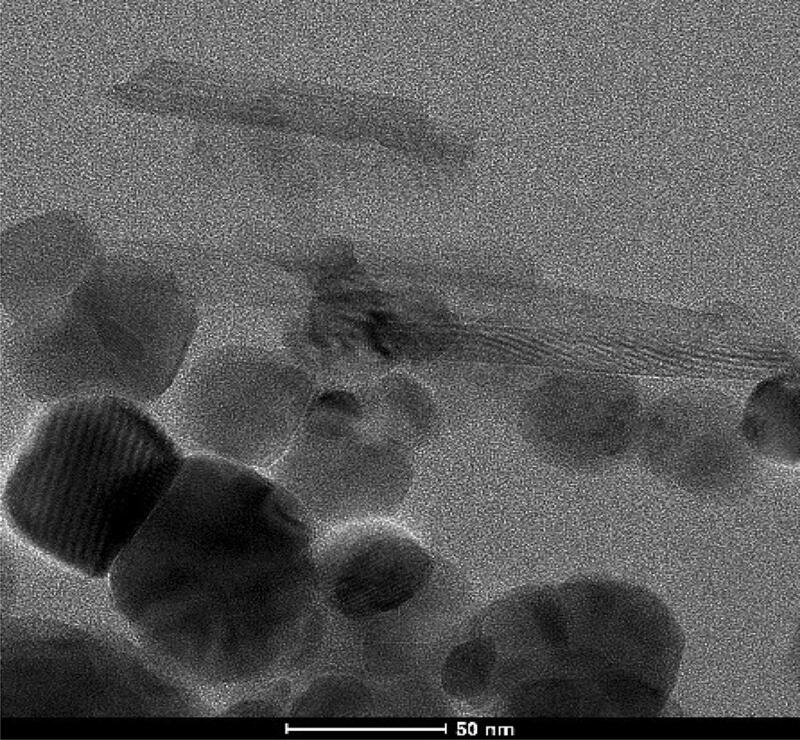 In adsorption operation, nanocarbon tubes (CNTs) are effectual adsorbents to eluting of organic and inorganic pollutants from aqueous solution, due to their comparatively large particular surface area, small size, hollow and their layering structures and risen thermal and chemical stableness [17, 18, 19, 20]. Adsorption operation is economical, easy and healthy. In this research, magnetic multiwalled nanocarbon tubes (MWCNTs) functionalized with chitosan were synthesized and then employed to elute nitrate ions from wastewater by adsorption technique. The impacts of solution conditions involving pH worth, temperature, contact time, the quantity of adsorbent and nitrate ion concentration on the adsorption conduct were determined. In this study, a multiwall carbon nanotubes functionalized with chitosan was used to remove nitrate from wastewater. The MWCN with chitosan was magnetized to increase the surface are. All the samples were characterized using FT-IR, TEM, TGA and other techniques to help us understand the adsorption and thermodynamic model including kinetics. All reagents in this study are used with no more purification. MWCNTs (O.D. 20–30 nm, with purity > 96%, purchased from Beijing DK Nanotechnology Co. Ltd., were used directly without any further purification. Chitosan was obtained from Sigma Aldrich Company in Madrid, Spain. Sulfuric acid (98%), nitric acid (65%), acetic acid solution (1%), glutaraldehyde (0.5%), FeCl3·6H2O, FeSO4·7H2O, NH4OH (25%), NaOH, HCl, and potassium nitrate all purchased from Sigma Aldrich, USA. In this research the following instrumentations and apparatus were used: pH meter (model: 3510, JENWAY), thermometer, shaking water bath (Daihan Labtech, 20–250 rpm Digital Speed Control), desiccators, UV spectrometry (model: UV-1601, SHIMADZU), glassware, TGA (Q50 V20.10 Build 36 instrument at a heating rate of 50 °C/min and in N2 gaseous atmosphere and FT-IR Spectrometer (Nicolet iS5, iD3 ATR, Thermo Scientific). The synthesis procedures were followed exactly like Xie et al. [19, 20, 21]. A known amount of ferric nitrate (100 mg) was dissolved in 50 mL deionized water to have a saturated solution at ambient temperature. About 1.0 g MWCNTs was dispersed into the saturated solution of ferric nitrate and stirred at 1000 rpm for 30 min. 15 mL concentrated HNO3 and 5 mL concentrated H2SO4 was added dropwise into the saturated solution under ultrasonic dispersion for 130 min, and the mixture left for 1 month. After filtration and drying, the sample was placed into a tube furnace under argon environment with a flow rate of 0.3 L/min at a heating rate of 10 °C/min until a final temperature of 950 °C for 2 h. After that, the compound was washed with deionized water several times and dried. About 1.0 g chitosan was dissolved in a diluted acetic acid (pH = 2) with stirring for 20 min to obtain a dispersion system. About 0.5 g of the ferrite-filled MWCNTs were added into the chitosan dispersion solution. The mixture was dispersed ultrasonic and mixed mechanically for at least 2 h.
A small amount of 0.1 M NaOH was added to have a pH of 10 while the mixture was heated up to 60 °C, 2 drops of the glutaraldehyde (25 wt%) were added to have a crosslinking reaction. Finally, the black products were obtained using centrifugation and washed with deionized water several times and dried at 50 °C (Scheme 1). 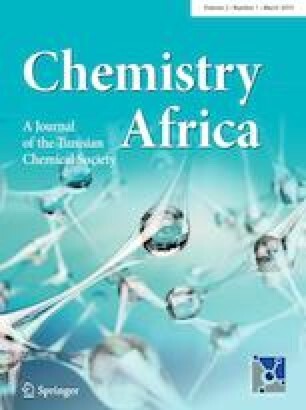 In this study, 1 mg of magnetic (MWCNTs) functionalized with chitosan and 10 mL sample of wastewater with a discerned concentration of nitrate ions were mixed and shaked. In studying those parameters, all variables were kept constant except the one under investigation. The influence of solution conditions involving; contact time, pH value, the quantity of adsorbent, concentration of nitrate ion and the value of temperature were studied. The filtrate jumble of each sample was taken to study the extent of the adsorption efficiency and to evaluate the remained quantity of the nitrate ion by using UV–visible spectrophotometry with maximum absorbance at 220 nm. A 50 ppm concentration of 10 mL of the standard solution of nitrate ion was added to 1 mg of magnetic (MWCNTs) functionalized with chitosan adsorbent at the optimum worth of pH. The solution was mixed using magnetic stirrer at 250 rpm and different temperatures ranging from 5 to 80 °C at optimal contact time were studied. After every sample was percolated, the quantity of any adsorbate was calculated by employing a UV–visible spectrophotometer instrument at the end of the time periods. This is was the suitable method to know the impact of temperature on each adsorption operation. A 50 ppm concentration of 10 mL of the prepared standard solution of nitrate was added to 1 mg of an adsorbent sample. The prepared mixtures were put at constant temperature 25 °C with shaking and stirring bath. This is study was operated in the range of a pH from 2 to 12 using both 0.1 M NaOH and 0.1 M HCl to have the desired pH. To determine the optimum concentration of the adsorption operation, 5–50 ppm of 10 mL of several concentrations of the NO3− solution was added to 1 mg of adsorbent, at optimized temperature 25 °C, pH = 2 and contact time 50 min. Seven vials including 50 ppm of 10 mL of nitrate ion standard solutions were added to (0.3, 0.5. 0.8, 1.0, 1.2, 1.4 and 1.6 g) of the adsorbent to know the optimum quantity of adsorbent that is needed for the adsorption of nitrate on the adsorbent. A 1 mg of an adsorbent was shaken with a 50 ppm samples of standard solutions at pH value equal 2. The adsorption operation of nitrate ion on every sample of adsorbent was determined as a function of joggling time under 25 °C. Every sample was percolated off and the quantity of every adsorbate is measured by employing UV–visible spectrophotometer instrument at the end of periods of time ranging from 1 to 200 min. The relationship between nitrate adsorbed onto the adsorbents and nitrate in the solution are expressed using adsorption isotherm. These isotherms are essential to discover unique adsorbents and to find the best and ideal design parameters for adsorption system. Adsorption models were produced to forecast the system performance and to make a comparison in different systems. They define the interaction between adsorbent materials and pollutants; as a result, they are critical to optimize the adsorption system, the properties of the surface and adsorbent capacities. If the adsorbent and the adsorbate are being in contact for enough time, they reach to equilibrium state where there is a dynamic reaction between the adsorbate in the bulk solution and the solution interface. The adsorption data is described using several models such as Langmuir and Freundlich) models that are the most widely used. while, Ce assigned to the concentration of nitrate ion at equilibrium (mg/L), qe assigned to the quantity of nitrate adsorbed in mg per mass of the adsorbent in gram (mg/g), qm assigned to the optimum single layer coverage capability (mg/g) and KL is the constant of Langmuir adsorption isotherm model (L/mg) and describe the binding energy. where b is the Langmuir constant and C0 is the initial concentration nitrate ion. RL value describes the type of Langmuir isotherm, where if RL = 0 means an irreversible adsorption, and if 0 < RL < 1 means a favorable adsorption, RL = 1 shows a linear adsorption and if RL > 1, it is an indication of unfavorable adsorption [24, 25, 26, 27]. The adsorption of nitrate ion from the sample of wastewater was determined by adsorption operation employing the prepared adsorbent of magnetic multiwalled nanocarbon tubes (MWCNTs) functionalized with chitosan. The adsorption technique depends on the suboptimal condition of a dose of adsorbent, concentration, contact time, pH and temperature. The concentration of nitrate was studied before and after the adsorption process by using UV-spectrophotometer instrument. The eliminating information was constructed by the Freundlich and Langmuir equations of adsorption isotherm. Also, their corresponding factors worths were calculated. Moreover, kinetic models of pseudo-second order and pseudo first order were studied in this work when the empirical information acquired for several contact time was employed. 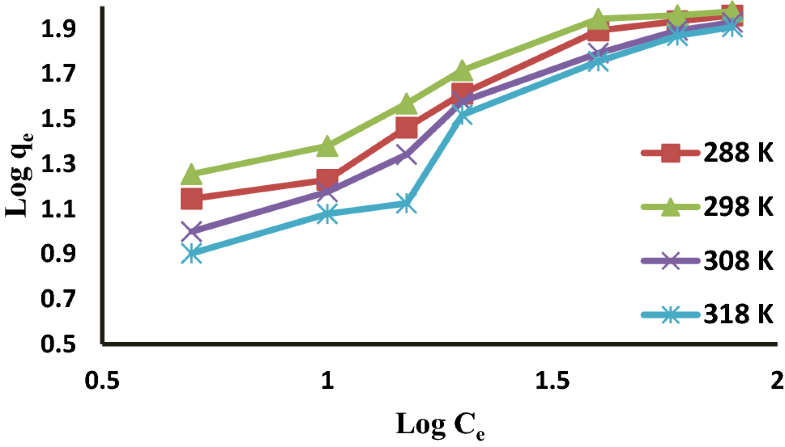 Kinetic model parameters of pseudo-second order and pseudo first order K, Qe and R2 for nitrate adsorption on magnetic multi-walled nanocarbon tubes (MWCNTs) functionalized with chitosan were calculated. Also, calculated and experimental values of Qe were compared to each other [26, 27, 28, 29]. By employing Van’t Hoff’s form relation the thermodynamic factors such as free energy, enthalpy, and entropy (ΔG, ΔH, and ΔS respectively) were determined for the systems. At several temperatures ranging from 30 to 70 °C with periods of 10 °C, the worths of % eluting and Kd for dye systems were determined. These studies were done for a mixture of 10 mL of 50 mg/L of nitrate solution and 0.1 g of adsorbent at pH 2 and constant temperature (25 °C). Transmission Electron Micrographs of magnetic multiwalled carbon nanotubes (MWCNTs) functionalized with chitosan can be vigorously used as suitable adsorbents for eluting toxic ions. This adsorbent expounds a risen porous and rough nature as shown in Fig. 1. Both magnetic MWCNTs and magnetic MWCNTs functionalized with chitosan were analyzed for the magnetic properties using vibrating sample magnetometer (VSM) at room temperature. The magnetic hysteresis curves for both samples are shown in Fig. 2. 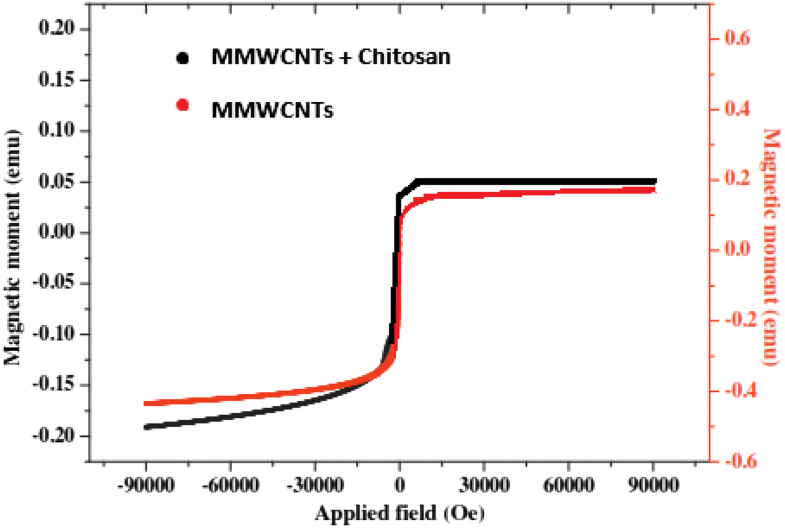 From the figure, the saturation magnetic moment of the two samples was 0.2 for MWCNTs and 0.18 for MWCNTs with chitosan. The small reduction of the magnetic moment in MWCNTs with chitosan was probably due to some rearrangement in the structure and new bonds made due to grafting. To investigate the thermal stability as well as the formation and purity of materials, thermogravimetric analysis (TGA) superinducing with the weight loss derivative curve (DTG) are used. 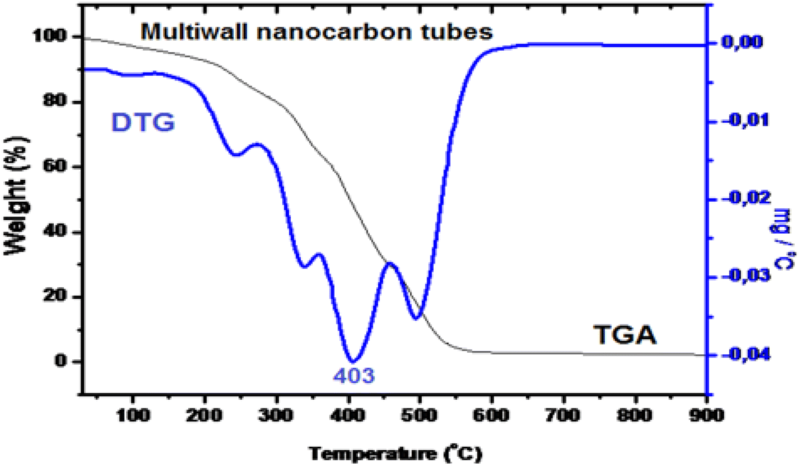 It is a potent method to quantitatively appraise of the multiwall nanocarbon tubes samples. In Fig. 3 the multiwall nanocarbon tubes showed three clear steps of mass loss. Step 1: From 25 to 250 °C rang and step 2: from 250 to 350 °C rang and the third step from 350 to 450 °C and the last step at 505 °C. The greatest rate of decomposition occurs at 403 °C. The multiwall nanocarbon tubes sample was checked up on FT-IR analysis. Figure 4 shows the FTIR spectrum of multiwall nanocarbon tubes. The broadband from 3100 to 3450 cm−1, peaks at 2850 cm−1 and 2935 cm−1 were indicated to O–H and C–H stretching vibration, consecutively. The absorption peak at 1710 cm−1 was because of C=O bond, the peak at 1590 cm−1 was indicated to C=C stretching vibration. Also, at 1242 cm−1 C–O stretching vibration was acquired. One of the more numerous significant parameters that are dominating the removal of nitrate ions from wastewater is pH value. The impact of pH value on NO3− removal from wastewater samples shows in Fig. 5. 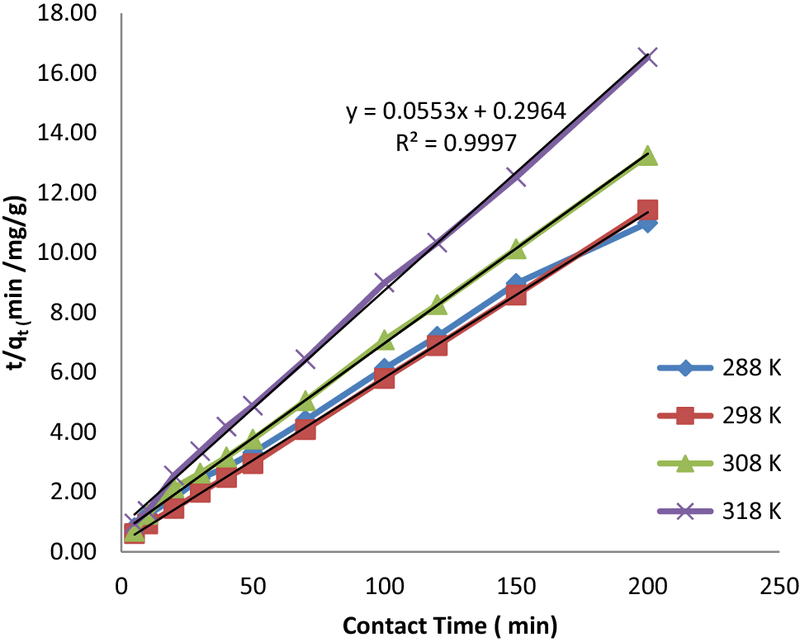 These tests were streamed at suboptimal contact times for magnetic multiwalled carbon nanotubes (MWCNTs) functionalized with chitosan adsorbent with a diverging pH value of the solution. In this study at low pH, there was the rise of the adsorption capability for NO3−. 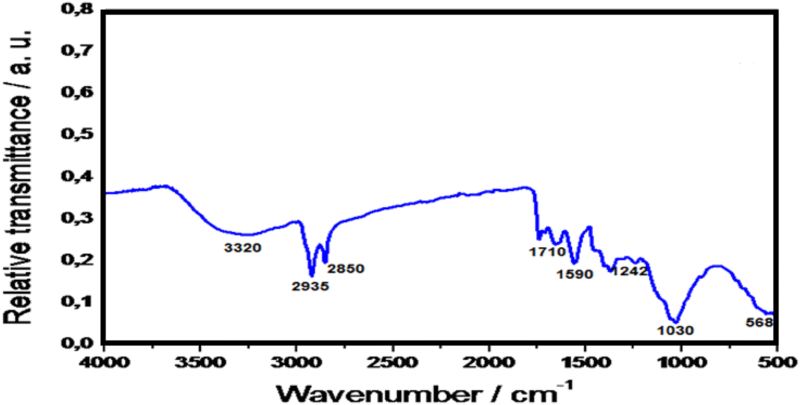 The adsorbent of magnetic multiwalled carbon nanotubes (MWCNTs) functionalized with chitosan has the maximum amount of NO3− removal that is 96.54% at the maximum pH = 2 as shown in Fig. 5a. This behavior is due to the excess of protons in solution at this value of pH. This increases the number of positively freighted sites on the adsorbent surface, which favor the adsorption of the nitrate anions onto the adsorbent surface due to electrostatic attraction to each other. The acid–base interaction between base nitrate and acid on the surface of the adsorbent also favors adsorption. While in other studies the percentage of nitrate removal was 79.5% at optimum pH = 5 by employing modified granular activated carbon at 25 °C . Also, the percentage of nitrate removal was 87% at pH = 7 by employing functionalized carbon nanotube sheets at 25 °C [19, 20, 21, 22, 23, 24, 25, 26, 27, 28, 29, 30, 31]. Temperature acts as a critical parameter in every type of adsorption process. Adsorbent and nitrate interplay temperature appeared in Fig. 6. This figure shows that rising in temperature above to the room temperature (25 °C) has an impact on reducing the adsorption capability of the adsorbent surface. Reduce in eluting percentage may be due to the reduction of the physical forces of attraction between the adsorbent and nitrate ion and temperature affects the adsorption rate by altering the molecular interaction and the solubility of the adsorbate . The impact of the concentration of nitrate on adsorption capability was studied over a wide range of nitrate concentration with conserving other factors like quantity of adsorbent, the volume of solution, adsorbent size, and solution pH as constant. Figure 5b shows that as the NO3− concentration increases from 30 to 260 mg/L, the adsorption capability is rising from 9 to 68 mg/g. This may be due to a gradual rise in the electrostatic attraction between nitrate ions and the absorbent desired active sites besides the increasing number of vacant sites. While in the study of nitrate removal by employing powder activated carbon and carbon nanotubes at optimum pH = 5, contact time = 60 min and temperature = 25 °C the adsorption capacity of AC was 10 mmol/g and the adsorption capacity of CNT was 25 mmol/g . Impact of the quantity of adsorbent on the eluting of nitrate ion was studied whereas, the initial concentration of nitrate solution was conserved constant at 50 ppm also, the volume of wastewater sample was 10 mL, pH was 2 and temperature was kept at 25 °C. The consequences are shown in Fig. 5c and it demonstrates the eluting effectively of nitrate ion has risen with a rising amount of adsorbent until 250 mg. After that, the eluting effectively was not changed noticeably with a rising amount of adsorbent. It shows that eliminating effectively was 97.25% at 250 mg of dosage. While for 300 mg was 98.7% and 99.1% for 400 mg and 99.2 for 500 mg. The adsorption efficiency was increased because of the risen in the number of adsorption sites . Consequently, % removal of nitrate ion accessed in equilibrium with the quantity of 250 mg of adsorbent. while Co assigned to the concentration of nitrate ion in the sample solution of wastewater before treatment and Ce assigned to the concentration of nitrate ion in the sample solution of wastewater after treatment. Eluting effectively also can be determined by employing of the absorbance of the amount of the nitrate ion in the solution sample of wastewater ahead of tackling Ao and absorbance of the amount of the nitrate ion in the solution sample of wastewater later of tackling Ae rather than Co and Ce consecutively. The adsorption capacity of NO3− on magnetic multiwalled carbon nanotubes (MWCNTs) functionalized with chitosan was determined as a function of contact time to determine the optimum time of adsorption at constant pH, the concentration of nitrate ion, amount of dosage and temperature as shown in Fig. 5d. 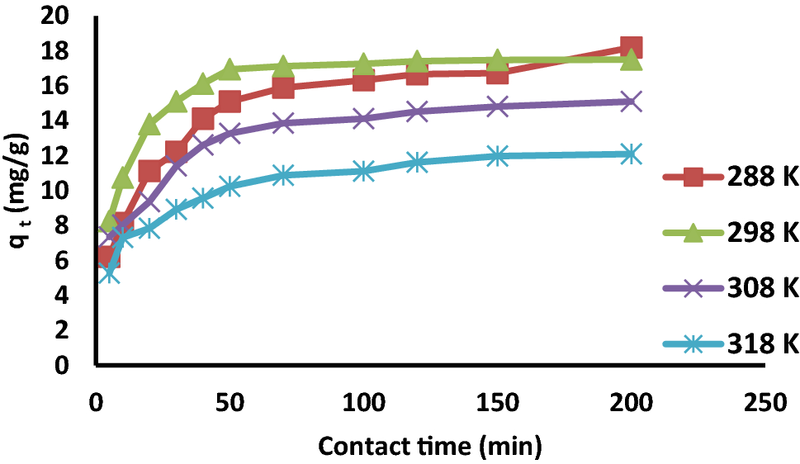 The removal of NO3− from wastewater on magnetic multiwalled nanocarbon tubes (MWCNTs) functionalized with chitosan was 88% at the optimum of contact time 50 min. Moreover, the residual concentration of the nitrate ion after suboptimal contact time becomes roughly constant and the rising percent of NO 3 ¯ removal was because of the rising availability of vacant positions on the adsorbent surface. Adsorption isotherms which have an important role in investigating the ability of an adsorbent to capture a pollutant down to a specific charge value . The isotherms performed at pH = 2, and a range of different temperatures of 15, 25, 35, and 45 °C for the removal of NO3− using magnetic MWCNTs are shown in Fig. 7. The adsorption capacities decreased with increasing temperature which might indicate an exothermic process. This increase has to do with the increase in thermal energy of the magnetic MWCNTs species when temperature increased . Techniques of the adsorption isotherm are discriminated by some constant worths, that determine the characteristics and attraction of the adsorbent surface and can be employed to find the optimum adsorption capability. The main suitable isotherm models to determine empirical adsorption operation factors are the Langmuir, Freundlich, and Temkin models [30, 31]. From our study for Langmuir model, the RL values obtained in the present study (Table 1), were all 0 < RL < 1 which indicates a favorable adsorption at all the temperatures, and it also demonstrates the efficiency of the magnetic MWCNTs adsorbent. The values of qm and KL were calculated from Ce/qe versus Ce plot where, slope = 1/qm and intercept = 1/qm KL as shown in Fig. 7, quantity adsorbed for single layer data (qm), constant of Langmuir adsorption–desorption at equilibrium (KL) and regression constant (R2) were determined and values are shown in Table 1.
where KF (mg/g) and n are constants of Freundlich isotherm used to describe adsorption capacity (mg/g) and intensity, while Ce and qe are the concentration of the adsorbate at equilibrium (mg/L) and the amount adsorbed at equilibrium (mg/g), respectively. Figures 8 and 9 show both Langmuir and Freundlich isotherm plots for different temperatures. All the Freundlich and Langmuir isotherm parameters with the correlation factors (R2) are summarized in Table 1. The correlation coefficients for the Langmuir isotherm model were between 0.965 and 0.986 while for Freundlich were between 0.947 and 0.974 indicating the adsorption is much represented by Langmuir. The values of RL were between 0 and less than 1 indicating favorable adsorption. The values of 1/n also indicate natural adsorption and they were less than 1 indicating the data were best fitted to Langmuir adsorption model [32, 33, 34]. The maximum adsorption capacities were between 119 and 322 mg/g and were highest at 25 °C. The higher adsorption capacity could be attributed to the increased surface area due to the presence of the magnetic species. The constants n and K change to reflect the experiential noting that the amount of the adsorbed increases more lingeringly and higher pressures are needed to saturate the surface when the temperature increases . Table 2 shows that 1/n value = 1.279 while n = 0.78 adverting that the sorption of nitrate on magnetic (MWCNTs) functionalized with chitosan adsorbent is suitable and the R2 value is 0.962. The adsorption information was calculated using the Freundlich and Langmuir adsorption isotherms. The value of RL determined by Langmuir isotherm information in Table 1 was 0.47 at 25 °C while n = 78 denoting that adsorption of nitrate at magnetic MWCNTs functionalized with chitosan is preferred with R2= 0.944. Kc can be measured by plotting Ln (qe/Ce) as a function of qe. All thermodynamics parameters are listed in Table 3. All the values fore ΔGo were negative values which indicate that adsorption was spontaneous under experimental conditions. Another thing is the values of ΔG0 increased at increased temperature, showing that the adsorption process is highly efficient and favorable under low temperature. The value of ΔHo < 0 means that the adsorption was exothermic which means we have physical adsorption, and this was noticed during the studying of the effect of temperatures. The value of ∆H was larger than those comparable with physical adsorption. That means the adsorption operation is chemical. The positive value of entropy ∆S° means that the wantonness at the solid/liquid interface in the adsorption system rises during the operation of adsorption and some structural differences occur on the adsorbent . The negative values of entropy change (ΔS0) reflected the affinity values of nitrate on magnetic MWCNTs decorated with chitosan, thereby indicating certain structure variations in MWCNTs and decreasing the interface randomness between MWCNTs and aqueous solution . where K2 assigned to the rate constant of the pseudo-second-order (g mg−1 min−1), qe and qt represent the amount of nitrate (mg/g) at equilibrium and different time t(min). The kinetic parameters were obtained by plotting t/qt versus t and shown in Fig. 10 and Table 4. From the figure, all temperatures showed straight lines with excellent correlation factors. Another thing is the calculated qe values for the whole temperatures agree well with experimental values with small variations. This indicates that the adsorption can be better described by the pseudo-second-order. where qe assigned to the quantity of NO3− adsorbed at equilibrium in (mg/g), qt assigned to the quantity of NO3− adsorbed in every time in (mg/g) and K1 assigned to the rate constant of the Lagergren equation (min−1). All parameters for plotting Ln(qe − qt) versus t are summarized in Table 4. From the table, we can see that the correlation coefficients (R2) are less than the one for the pseudo-second-order and the calculated qe values do not match with the experimental values. Recovery of nitrate from the adsorbent was achieved at room temperature. The first step was filtration to collect the adsorbent. The second step was washing the adsorbent with 0.1 M NaOH then washing with deionized water, and finally left the adsorbent to desiccate at room temperature for 3 days. 100 mg of the regenerated adsorbent was added to a 10 mL of 50 ppm of nitrate solution at pH = 10 in order to compare the adsorption capability of the regenerated adsorbent with fresh adsorbent. Figure 11 shows small variations between the amount of nitrate ion eluting after the first to the six regenerations of adsorbent as shown in this plot. This is strong evidence that the magnetic multiwalled carbon nanotubes (MWCNTs) functionalized with chitosan adsorbent can be used for several times as shown in Fig. 11. 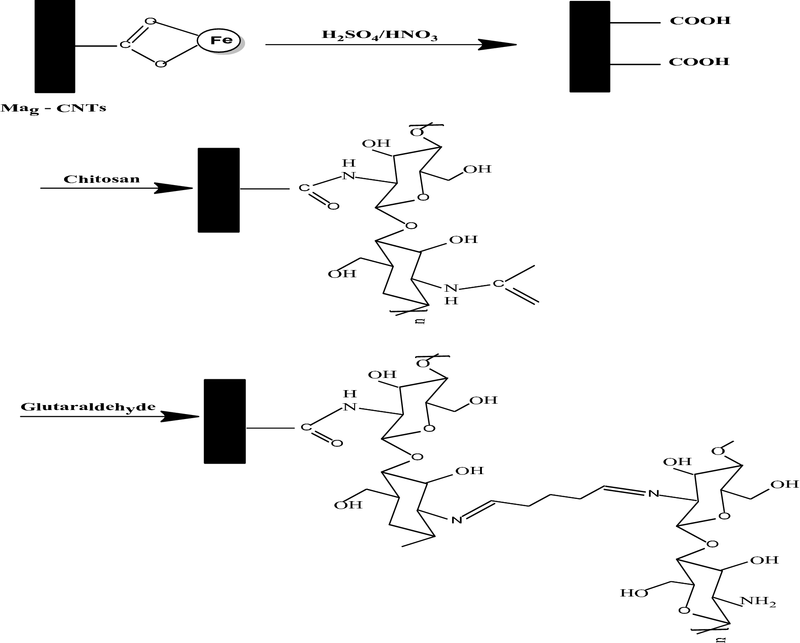 The magnetic multiwall carbon natures functionalized with chitosan was synthesized. The compound was characterized using VSM, TEM, TGA and FTIR. All adsorption parameters like effect of pH, Temperature, contact time were studied. Adsorption kinetics like pseudo first order and pseudo second order were used to understand the mechanism of adsorption and our study showed that pseudo second order was much better to represent the adsorption process. This has to do with the correlation coefficient and the adsorption capacity of the calculated and the experimental were very closed. The adsorption was studied by Freundlich and Langmuir isotherm models and the data fitted much better to Langmuir. The negative ΔGo, ΔHo and negative standard entropy showed that we have physical adsorption and spontaneous. 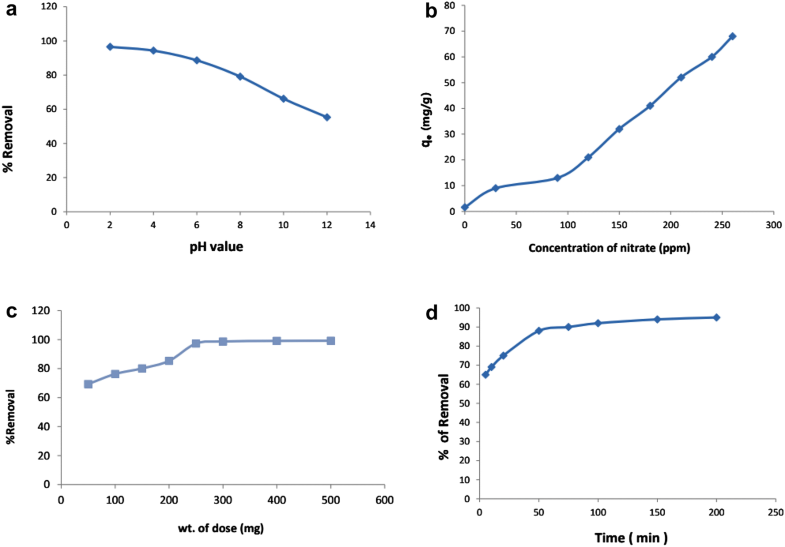 Magnetic MWCNTs functionalized with chitosan removed NO3− from wastewater and it was recyclable for several times with removal efficiency exceeded 95%. The authors would like to thank the MEDRC for their scholarship for the graduate student Inas Ibsharat and would like to extend their thank to the Palestinian Water Authority for their financial support. Part of this study has been done in the framework of the USAID-USGS Grant Number G17AS00001.